Thursday November 16 1911 I left McCalls at 8.30 for down town Clarence going with me. and The North Western depot at 10 oclock for home. The trip was very pleasant made a close connection on [illegible] at Cedar Rapids gettign home at 5.15. Got supper and visited with Will all evening. Friday November 17 1911 I cleaned up the cellar and did some baking in forenoon [Lorie?] Hattie & Cora are out in afternoon but went home at 5.15. It was a cold day. I made tatting in evening. Wrote cards to Lydia and Ida [Cotter?] 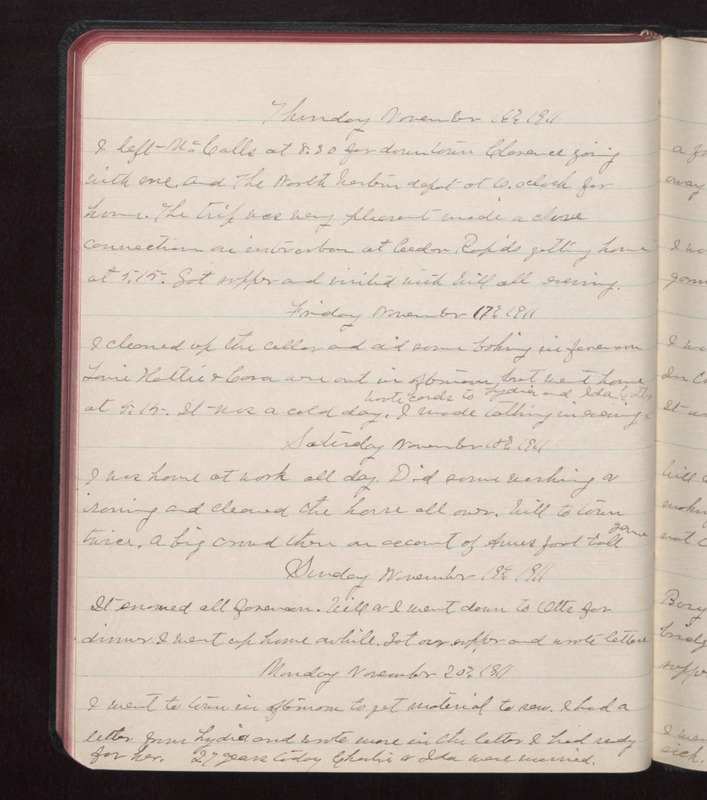 Saturday November 18 1911 I was home at work all day. Did some washing & ironing and cleaned the house all over. Will to town twice. A big [illegible] there on account of Ames football game Sunday November 19 1911 It snowed all forenoon. Will & I went down to Otts for dinner I went up home awhile. Got our supper and wrote letters. Monday November 20 1911 I went to town in afternoon to get material to sew. I had a letter from Lydia and wrote more in the letter I had ready for her. 27 years today Charlie & Ida were married.